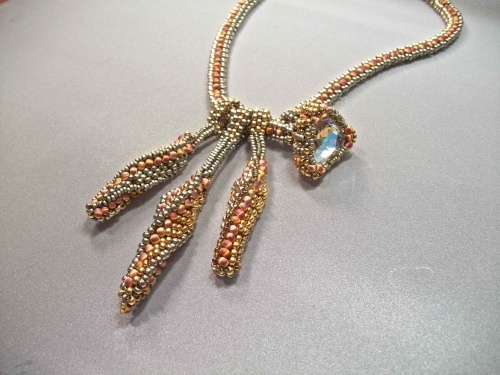 A trio of buds, each on its own beaded bail, hang on a necklace of metallic and stripey beads. At one end, the bezeled triangular stone is meant to be worn in the front while providing camouflage for the magnetic closure. Learn the versatility of a South African stitch, regrettably named polygon stitch. Whip up an oval rope necklace. Weave each bud individually to hang from its own bail. Learn how to create their organic shapes by increasing & decreasing within the stitches of a triangular rope. Capture the triangular stone securely in a highly textured bezel that works up quickly, and conceals the closure.